132 calories per pack. No liquid, no mess!.The best olives are selected, pitted and marinated to allow the flavour of the chilli peppers to infuse the olives. 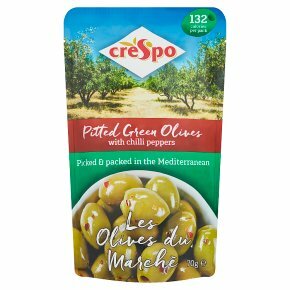 Les Olive du Marchébring the true flavour of the Mediterranean to your salads, parties and everyday snacks! Warning: This product may contain olive stones, eat with care.